Since its initial production, we have concentrated only on colour compounding of thermoplastics until the management has made its decision to go one step higher to venture into specialty compound in year 2002. As of today, CIPC compounds a wide range of commodity as well as engineering thermoplastics. There is a wide selection of fillers, additives and reinforcements depend very much on different products applications. Apart from our general products grades, we do specialize in developing special formulations to meet complex product design requirements. Compounding is a process of melting and blending of polymers with some other additives as well as fillers to achieve a certain polymer performance for different product applications. This process changes the physical, electrical, thermal as well as aesthetic properties of polymers. Our experienced engineers have more than 15 years of specialty compounds experience by combining a wide range of base resins with different types of additives, fillers, reinforcers and pigments which leads to superb quality structural, precoloured, lubricated, flame retardant, electrically and thermally conductive compounds. 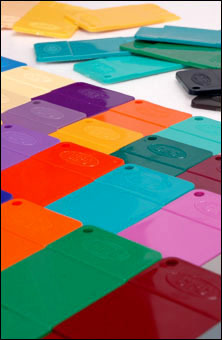 Colour compounding for most of the thermoplastic resins such as ABS, PS, PP, PE, AS, Nylon, PBT, PET, POM, PMMA and PC. Specialty compounds such as weather resistant, wear resistant, flame retardant, Talc, Wollastonite, glass & carbon fiber compounds for most of the engineering thermoplastic such as ABS, PC, PA 66/6/11/12, PSU, PEEK, PES etc. Latest computer colour matching spectrophotometer comes with colour matching software.